It’s the perfect start to celebrating a decade in business. 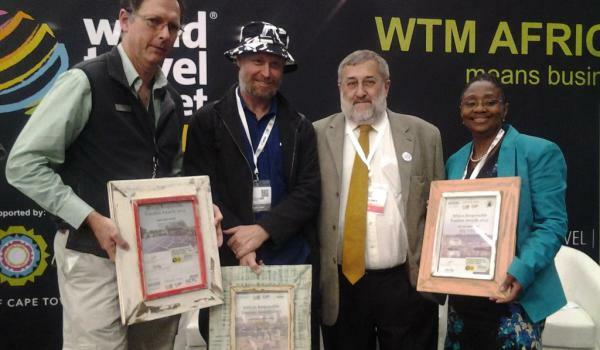 On Thursday 16 April 2015, Coffeebeans Routes won the category Best for Engaging People and Cultures in the African Responsible Tourism Awards, at the World Travel Market Africa in Cape Town. The runners-up were !Khwa ttu San Culture and Education Centre, Nkwichi Lodge and TFPD Foundation for the work done at Baleni Camp. As the winner in their category, Coffeebeans is automatically entered into the World Responsible Tourism Awards, taking place at the World Travel Market in London in November 2015. Coffeebeans Routes founder and creative director Iain Harris received the award on behalf of the company. “What a great way to celebrate our 10th year in business, it’s a confidence booster and an energy booster. It’s an affirmation of the intellectual vigour we apply in challenging assumed notions of who we are in this country, and creating nuanced experiences that attempt to unpack that complexity and present new narratives. This is for us what responsible and sustainable practice means.